I am pleased to introduce my new blog where I'll be sharing findings and revelations from my nine years of research into source texts on Hatha Yoga as it evolved in the Tantric tradition. Yogavidhi is a Sanskrit term given in the ancient Tantras for the pan-Tantric daily Yoga ritual from which all modern Asana-based systems of Vinyasa Yoga derive. For nine years I have studied ancient Tantras and what I have discovered is simply extraordinary - ancient roots of Vinyasa-based Yoga. Hatha Yoga texts from the post-Tantric eras are comprised of techniques derived from the daily Yoga ritual known as Yogavidhi, common to all Tantric lineages (ca. 500-1500 AD). The term Vidhi means practice, procedure, rule or regimen. Thus, the Tantric scriptures defined Yogavidhi as a set procedure of physical and subtle yogic practices or kriyās, performed in a specific, ritualized sequence (vinyāsa) led by mantras, imbued with the presence of the divine manifest in sonic form. The sequencing in haṭhayoga, as originally prescribed in the Tantras, is based on the natural order of vowels in the Sanskrit alphabet, vowels which represent the liberating power (śakti), force (bala) or seed (bīja) mantras. These mantras were in turn choreographed to Yoga practices engaged physically, mentally and vocally. 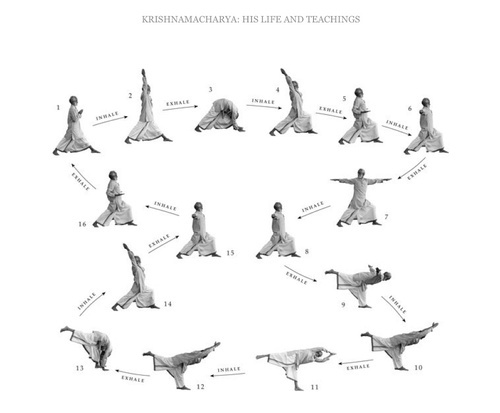 This is epitomized in the Tantric Namaskāra kriyā, comprised of a series of body postures choreographed with, and led by, a sequence (vinyāsa) of solar ‘seed’ mantras. All yoga practices comprised of mantra-led physical postures, such as Namaskāra, were later omitted in the post-Tantric Hatha Yoga corpus. The goal of my research works and teachings are to unveil numerous Namaskāra practices from unpublished Tantric texts.